Yazd University, Industrial Engineering Dep. , Yazd, Iran. In this paper, it was an attempt to be present a practical perishability inventory model. The proposed model adds using spoilage of products and variable prices within a time period to a recently published location-inventory-routing model in order to make it more realistic. Aforementioned model by integration of strategic, tactical and operational level decisions produces better results for supply chains. Due to the NP-hard nature of this model, a genetic algorithm with unique chromosome representation is used to achieve the optimal solution and reasonable time. Finally, the analysis is carried out to verify the effectiveness of the algorithm with and without considering the cost of spoiled products. Ahmadi-Javid, A., and A.H. Seddighi, (2012). “A location-routing-inventory model for designing multisource distribution networks”, Engineering Optimization, Vol. 44, No. 6, pp. 637-656. Bell, W. J., (1983). “Improving the distribution of industrial gases with an online computerized routing and scheduling optimizer”, Interfaces, Vol. 13, No. 6, pp. 4–23. Brodheim, E., (1975). “On the evaluation of a class of inventory policies for perishable products such as blood”, Management Science, Vol. 21, No. 11, pp. 1320–1325. Duong, L., (2015). “Multi-criteria inventory management system for perishable & substitutable products”, Procedia Manufacturing, Vol. 2, pp. 66-76. Forouzanfar, F., and R. Tavakkoli-Moghaddam, (2012). “Using a genetic algorithm to optimize the total cost for a location-routing-inventory problem in a supply chain with risk pooling”, Journal of Applied Operational Research, Vol. 4, No. 1, pp. 2-13. Fakhrzad, M.B., and A. Sadri Esfahani, (2014). “Modeling the Time Windows Vehicle Routing Problem in Cross-docking Strategy Using Two Meta-heuristic Algorithms”, International Journal of Engineering, Vol. 27, No. 7, pp. 1113-1126. Fakhrzad, M.B., M.E. Ramazankhani, A. Mostafaeipour, and H. Hosseininasab, (2016). “Feasibility of geothermal power assisted hydrogen production in Iran’, International Journal of Hydrogen Energy, Vol. 41, No. 41, pp. 18351-18369. Hiassat, (2017). “A genetic algorithm approach for a location-inventory-routing problem with perishable products”, Journal of Manufacturing Systems, Vol. 42, pp. 93–103. Fakhrzada, M.B., and M. Moobed, (2010). “A GA Model Development for Decision Making Under Reverse Logistics”, International Journal of Industrial Engineering, Vol. 21, No. 4, pp. 211-220. Fogue, M., (2016). “Non-emergency patient transport services planning through genetic algorithms”, Expert Systems with Applications, Vol. 61, No. 1, pp. 262-271. Liu, S., and S. Lee, (2003). “A two-phase heuristic method for the multi-depot location routing problem taking inventory control decisions into consideration”, Int. J. Adv. Manuf. Technol., Vol. 22, pp. 941–950. Hiassat A, and Diabat A., (2011). “A location-inventory-routing problem with perishable products”, Proceedings of the 41st International Conference on Computers and Industrial Engineering. Javid, A.A., and N. Azad, (2010). “Incorporating location, routing and inventory decisions in supply chain network design”, Transportation Research Part E: Logistics and Transportation Review, Vol. 46, No. 5, pp. 582–597. Liu, S., and C. Lin, (2005). “A heuristic method for the combined location routing and inventory problem”, Int. J. Adv. Manuf. Technol, Vol. 26, pp. 372–381. Le, T., Diabat, (2013). “A column generation-based heuristic algorithm for an inventory routing problem with perishable goods”, Optimization Letters, Vol. 7, No. 7, pp. 1481–1502. McCal J., (2005). “Genetic algorithms for modelling and optimization”, Journal of Computational and Applied Mathematics, Vol. 184, pp. 205–222. Mirzaei, S., and A. Seifi (2015). “Considering Lost Sale in Inventory Routing Problems for Perishable Goods”, Computers & Industrial Engineering, Vol. 87, pp. 213-227. Rayata, F., (2017). “Bi-objective reliable location-inventory-routing problem with partial backordering under disruption risks: a modified AMOSA approach”, Applied Soft Computing; Vol. 59, pp. 622-643. Sajjadi, S.R., and S.H. Cheraghi, (2011). “Multi-products location–routing problem integrated with inventory under stochastic demand”, Int. J. Industrial and Systems Engineering, Vol. 7, No. 4, pp. 454-476. Schuster Puga, and M., J. Tancrez, (2017). “A heuristic algorithm for solving large location-inventory problems with demand uncertainty”, European Journal of Operational Research, Vol. 259, pp. 413-423. Shaabani, H., and I. N. Kamalabadi, (2016). “An efficient population based simulated annealing algorithm for the multi-product multi-retailer perishable inventory routing problem”, Computers & Industrial Engineering, Vol. 99, pp. 189-201. Shen, Z.J.M., and L. Qi, (2007). “Incorporating inventory and routing costs in strategic location models”, European Journal of Operational Research, Vol. 179, pp. 372–389. Song, B. D., and Y. D. Ko, (2016). “A vehicle routing problem of both refrigerated- and general-type vehicles for perishable food products delivery”, Journal of Food Engineering, Vol. 169, pp. 61-71. Tarantilis, C.D., and C.T., Kiranoudis, (2002). “Distribution of fresh meat”, Journal of Food Engineering, Vol. 51, No. 1, pp. 85-91. Zanoni, S., and L., Zavanella, (2007). 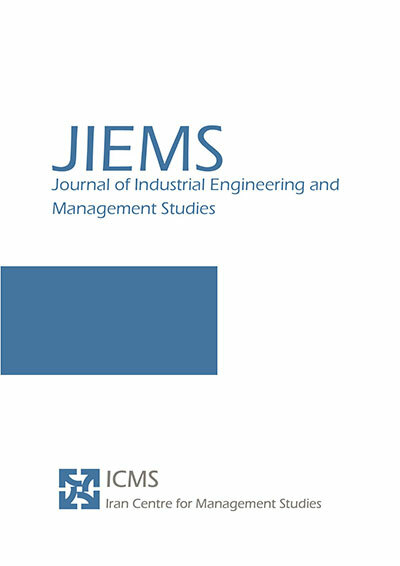 “Single-vendor single-buyer with integrated transport inventory system: Models and heuristics in the case of perishable goods”, Computers & Industrial Engineering, Vol. 52, No. 1, pp. 107–123. Zhang, Y., (2014). “Hybrid meta-heuristic solutions to inventory location routing problem”, Transportation Research Part E: Logistics and Transportation Review, Vol. 70, pp. 305-32.